There seems to be a prevalent stereotype of artists being free-spirited, easygoing, and carefree. But in both my experience, and the experiences I’ve heard from other artists, this is far from the truth. 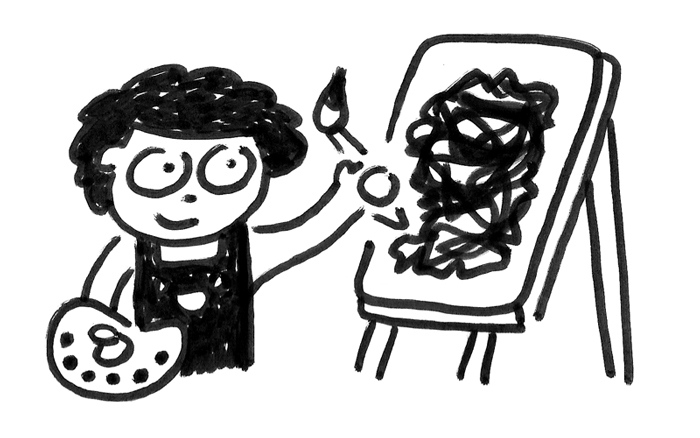 More often, artists are extremely hard on themselves, critical of their work, and care quite a lot about everything. 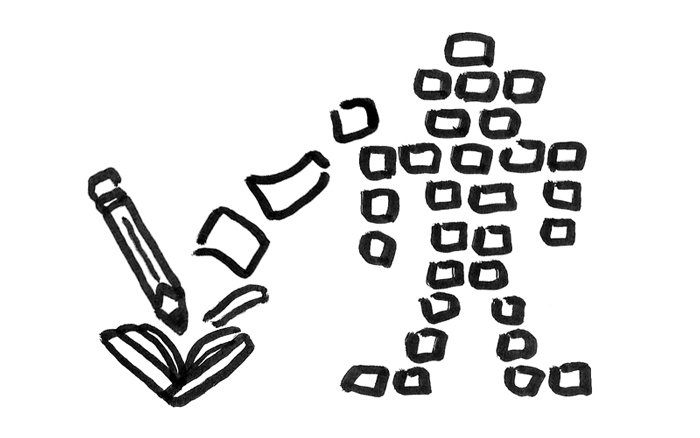 We can become rigid about our routines, frustrated with the creative process, and just generally stuck. We can become uptight, inflexible, and constrained. We can let our inner critic take hold and control the work we make, or worse, let it stop us from making any work at all. We can become constricted. We can become scared. We can become ashamed of our work. And we can become ashamed of ourselves. Perhaps the carefree-artist stereotype stuck because we got pretty good at putting on a carefree-artist mask. But I’ve heard time and time again from so many artists about that inner turmoil always bubbling beneath the surface. And I’ve come to realize that it can all boil down to one word: Shame. 1. A painful feeling of humiliation or distress caused by the consciousness of wrong or foolish behavior. 2. A loss of respect or esteem. 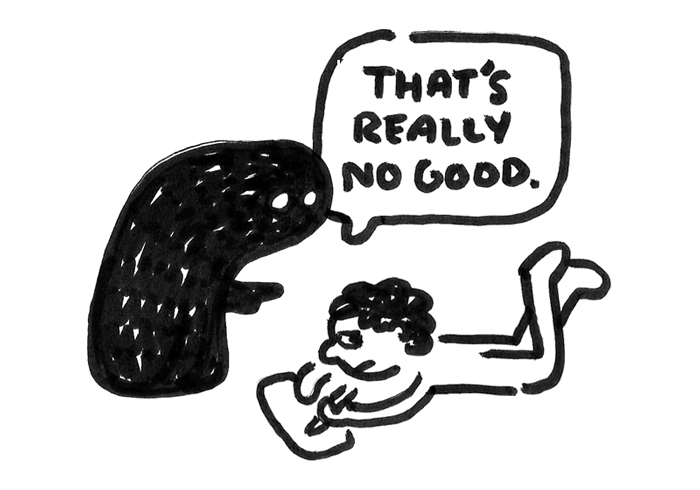 Artists tend to experience shame around their work often. And I’m not just talking about new artists either. All artists experience shame from time to time, even the famous ones you admire and look up to. We all feel this way at times. But these things scare me. I don’t want to live a life full of insecurity and dissatisfaction and unacceptance. I’ve already done that for most of my life. I know how that cycle feels and I know how it ends—it doesn’t.It goes on and on, getting worse and worse, until you wake up one day and realize how far you’ve taken it and what it’s done to you. You see the shell of yourself that you’ve become. 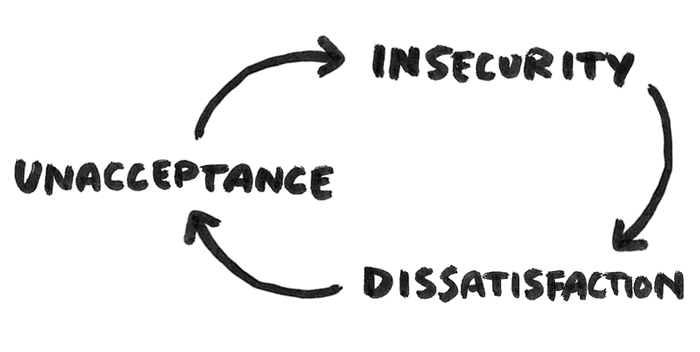 To be quite honest, this cycle of insecurities is where I’ve been and what I’ve been working on these past three months. Not with my art, but with myself. And not just as an artist, but as a person, with my job, my emotions, my relationships, my body… with myself as a whole being. I struggled with insecurities and shame around my art for years, but at some point I broke through (yep, you guessed it, it was that dang year, 2014). That’s mainly what I write about in these essays and teach in my courses—how to break free of that cycle of dissatisfaction with your art and come to a more powerful and healthy place of acceptance and love and fun. That process has worked wonders for my art. It’s led me to a place of freedom and confidence and joy when I draw. But I’m now realizing that I need to apply that same mindset to myself, not just as an artist, but as a whole being. I’m now realizing that while I broke through many of my artistic insecurities during 2014, I have let others grow and spread. I focused so completely, so wholeheartedly on my art, that I have neglected the rest of my being—my whole self. And so this is what I’ve been doing for the past three months. I put these essays on hold so I could focus on rebuilding myself—and my art has taught me how. My art has taught me how to see, accept, and love myself for who I am today.Because I am a whole person, not just a pile of sketchbooks and drawings. 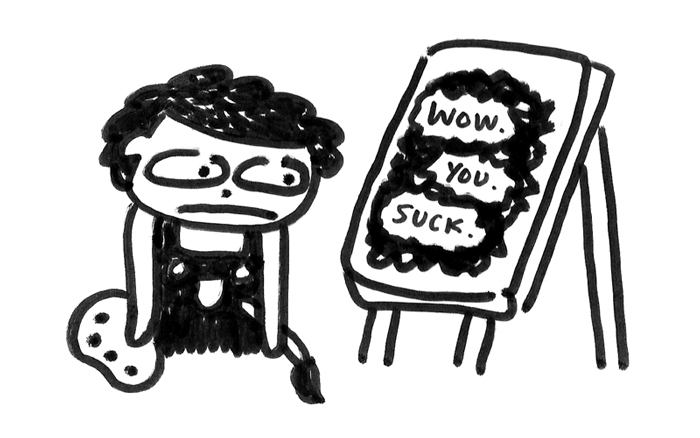 I am a person who makes drawings. And I want to draw more. And I want to do it from a place of wholeness. Because I’ve realized now that this is my motivation for drawing. Drawing enables me to be whole. Drawing allows me to peer inside my mind, allows me to look—really look—at those deep, dark blobbies, and teaches me to accept and love myself, blobbies and all. Shame and insecurity comes naturally to us artists, and it’ll never completely go away. But through our art, we can learn to see the shame for what it is and not let it stop us from making our own art and being who we truly are. If we let shame win, we’ll stop making art. We’ll stop drawing, and we’ll stop sharing. We’ll quit. It happens all the time. Almost all of us have stories from childhood where someone, be it a teacher, parent, or whatever, criticized our artwork and forever put that seed of doubt into our minds. And that seed snuggled its way deep inside the folds of our brain, and sprouts up every time we put pen to paper. We have to learn how to ignore that budding doubt and learn how to stop feeding it with our own critical thoughts. We can unlearn this cycle of shame, and we can do it in our art and in our lives. Because dang it if I don’t keep learning how deeply the two are intertwined, and how one can teach us so much about the other. And thankfully, I’ve begun to uncover what my art has been trying to tell me all along: the only thing with the power to overcome shame is vulnerability. Seeing—really seeing—and sharing our art can be the path to being vulnerable with others and, in time, with ourselves. Our whole selves. Thanks for reading. I’ll be back next week with more on art + blobbies. Then I remembered our little agreement/Manifesto: Just post it, Even if it doesn’t seem that great. Enjoy the process. Thanks again for your inspiration & I am glad your journey is going well.